I bought my first PSP back at the launch. The lack of good titles for several months drove me to want to trade it in. My oldest son liked it, so I gave it to him for his birthday along with a couple of new games. A few months later he also got frustrated with the lack of titles so I bought it back off him so he could get a video iPod. Flash forward two years, my youngest son saved his money for months and used his end of year report card money along with some game trade-ins to buy a used one. The game selection is MUCH better now, and with Dungeons & Dragons coming in July I bought another new one. 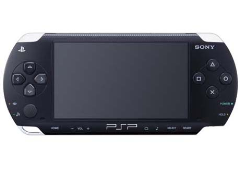 One major flaw has shown up in every single PSP. Stuck pixels in the LCD screen. My first one on launch had one, my son's used one has one, the new one I just bought had two, so I returned it and got another one with a stuck pixel, and the clerk at GameStop said hers has two. I've given up and decided just to keep the one I have since the pixel is at the edge, unlike the others. But I enjoy the handheld gaming device because I can hide anywhere in the house to play when the kids have a bunch of friends over. The minute you fire up the 360, they all want to play. And multi-player is so much better when everyone has their own screen. So I am willing to put with it. I wish Microsoft would enter this market. I had a DS and I didn't like most of the games. Over the course of a year I only found 3 I liked enough to play regularly, and I am starting to have the same problem with the Wii. Where is my Zune 360? Note: I haven't yet tried this to fix the problem. Many people are picking sides in the console war. But not GameStop. They just want you to spend all your money on every system. Hey, at least they are honest. Certain cultural phenomenon have often divided friends. Coke vs. Pepsi; Star Wars vs. Star Trek; Marvel vs. DC. Today, video games are the new battleground with a clear line drawn in the sand between the Nintendo Wii and PS3. Either system offers incredible gaming experiences, so take out a second mortgage and buy both! GameStop offers an PlayStation 4 Trade-in for $200 Credit. GET 50% EXTRA CREDIT WHEN YOU TRADE ANY GAME. Features: Not valid toward cash trades. Trades must be in full working condition to receive full value. Defective items may be eligible for trade at a lesser value. Trades subject to manager approval. Cannot be combined with any other offer. See store associate for details.